Pekka Kainulainen is one of the pioneers of Finnish performance art and clearly belong to the international avant-garde of todays performance art. His work breathes poetry, emotions and humanity. Kainulainen has been active, mainly in Finland since the early 1980s. His work always carries with it a strong emotional and physical presence, and at the same time a light poetic though profound humanity that only can be experienced. In a sense Kainulainen is an artistic shaman, bringing profound poetry and humanity to those that have the chance to experience his work. “In his art Pekka Kainulainen uses mythological methods that construct a story in order to describe ways of perceiving and understanding. In many of his performances he demonstrates to the audience the internal changes that happen when feeling and thought slowly create pictures and new meanings. His work often includes a very concrete coming into view or of being bared. Please visit Pekka Kainulainens website. Pekka Kainulainen. 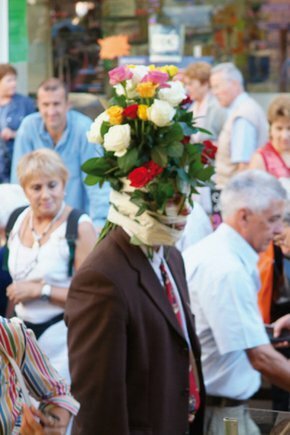 Flowerhead. Infr'Action Sète 2006. © Infr'Action and the artist.